The third time is definitely a charm, and it definitely doesn’t hurt to add a little (err, a lot of) New York City charm to it! 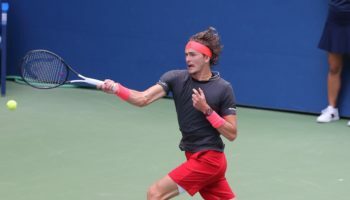 Welcome to Year Three of A Lot of Sports Talk‘s live blogging extravaganza at the U.S. Open, as we walk around the grounds – and avoid Ashe Stadium for the most part – to experience one of the most fun times of the year for a sports fan and/or sports journalist. Honestly, your body is getting a workout (a big plus) while hopping around the largest public tennis facility in the world (an even bigger plus), getting to watch the world’s best tennis players battle from sun up to sunset…and beyond! If you’re in the New York City area and able to afford a day pass, as well as play hooky from work, you should be here! Now! What are you waiting for? 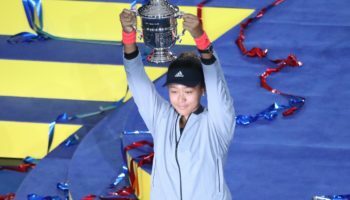 Oh, and it’s an extra special Around the Grounds this year, as, for the first time, A Lot of Sports Talk will be at Flushing Meadows through the entire tournament. (YAY!) Like always, we absolutely encourage you to contact on Facebook, Instagram or Twitter and let us know where on the grounds we should blog from. We always love your feedback. As we said, we’ll be in the borough of Queens throughout the tournament entire, so stay tuned and keep hitting the refresh button for our updates from the Billie Jean King National Tennis Center. Let’s have some fun, shall we? Latest entries are at the top of the page. 3:44 AM EST: Apologies to everyone, but this is where I have to leave you for tonight/this morning. Our soundbites that we from Saki will have to be posted tomorrow morning. Thank you, everyone, and I’ll see you really, really soon for Day 2! …followed by Jiri Vesely, who stated that, at the beginning of Saki’s struggles with cramping, he didn’t believe that he was actually having that problem and might have just needed time to regroup mentally. 12:42 AM EST: OK. Temporarily saying goodbye, as I have to catch this bus at 1 AM. Should be able to post in another hour to so and have those videos up. Stay up with me, you hear?!?! 12:39 AM EST: Almost done with the videos, but I want to catch the shuttle bus to Manhattan that leaves at 1 AM. Dilemma. 12:37 AM EST: Keys up 3-2 in second set, but now is getting treatment on her shoulder during the changeover. She’s called for a medical timeout. 12:14 AM EST: You think Madison Keys is having a Rio hangover? She put so much into that tournament and was SO CLOSE to earning a medal. 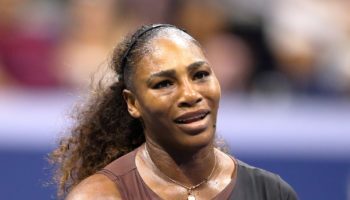 After her fourth-place finish, she was visibly disappointed, especially given the fun she was having in Rio and a couple of tough, grind-it-out victories she had there. Madison has been broken twice by Riske and is 0-for-2 on her break-point chances. Riske broke to start the second set, and is serving at 1-0, 40-40. 12:11 AM EST: Please head to the A Lot of Sports Talk Facebook page right now, as we’ve uploaded the video of Saketh Myneni walking off Court 9, walking through a phalanx of his supporters, old and new! So wonderful! 12:06 AM EST: IT’S AFTER HOURS!! WOOHOO! (I think.) As I’m editing right now, I’m also watching the only match in progress, the No. 8 Madison Keys and fellow American Alison Riske. And it’s Riske that has set point now at 5-4, 40-30. And lookie here: Riske wins the point and the first set! 6-4 to Riske. Man, and just when I thought I was going to leave early after uploading and editing the videos! Le sigh. 11:30 PM EST: Success! We got to interview both Saki and Jiri Vesely! Great interviews from both. Saki said something so profound about his experience signing autographs and stopping for everyone, even after his loss. Editing the videos STAT! Will be part of the “after hours” section of this blog. Hope you night owls will still be awake! 10:48 PM EST: UN-REAL! Saki is walking off to a hero’s exit. About 300 people within a 50-foot radius of him, most of them wanting a selfie or an autograph. And to Saki’s credit, despite obvious pain he’s feeling, he’s stopping for everyone! EVERY. SINGLE. PERSON. What a man. 10:30 PM EST: Unfortunately for the “Saki Squad,” as well as almost all of the supporters of Saketh Myneni, Vesely pulls through as Saki is barely able to walk. Will definitely try to talk with Saki after the match. 10:00 PM EST: Whether it’s cramps or his ankle, his condition has gotten worse. Vesely holds, then Saki, after winning first point at 5-3, gets broken and it’s back on serve. 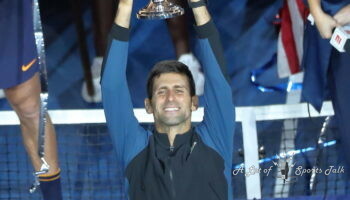 Maybe a blessing in disguise, as he’s able to get treatment on the changeover. 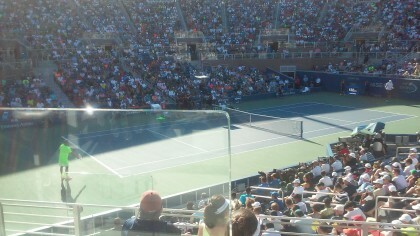 Finally found a seat here on Court 9. Oh, by the way, behind us on Court 7, Roberto Bautista Agut is in a fifth-set tiebreak against Garcia-Lopez. 9:51 PM EST: We made it to Court 9, and “Saki” Myneni is up 4-2. There’s only one problem: he’s being treated for a right ankle/foot injury as I walk in. After the timeout, he’s able to hold against Vesely for 5-2. Now it’s 30-30 on Vesely’s serve. Saki’s only two points away from victory. 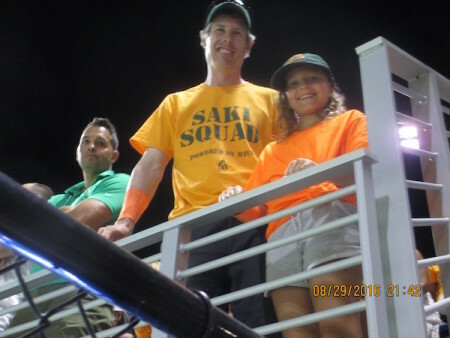 Oh, and we have pictures of the “Saki Squad” coming up shortly! 9:32 PM EST: Cuevas interview done. Now, off to Court 9, as Saketh Myneni is up a break at 3-1 in the fifth. By the way, here’s a good New York Times article on Saketh and his near Sisyphean task to qualify for a major. 9:06 PM EST: What defense from Fritz!! Keeps point alive with a couple of defensive lobs at 40-40, then Sock hooks a forehand wide! Break point for Fritz..and he breaks! Sock with a double fault! It’s 4-5 with Fritz back on serve! OK, time to motor to Armstrong! !…unless I get distracted…which I am right now, as Pablo Cuevas, is getting ready to go into the interview room! 8:59 PM EST: Decisions, decisions! First of all, still in the media room. Second, where do I go? On Court 9, there’s a great story evolving with 28-year-old Saketh Myneni, a qualifier from India who finally made the main draw of a major after five prior failed attempts at qualifying for majors through the qualifying tournament at that major. After losing the first set to Jiri Vesely, he won the next two sets. He’s down 2-5 in the fourth, so looks like a fifth set is coming. On Armstrong, the All-American matchup is going down to the wire. Sock won the first two, Fritz won the next two and now Sock has a 5-3 lead in the fifth. Might not make it for the end, with Sock serving. Well, maybe I will…it’s 30-30 in the service game as Sock hits a backhand wide crosscourt. 8:03 PM EST: Before coming across the raccoon and after the Sela-Cuevas match ended, I stayed around Court 4 and had a chance to talk with journalist Michael Lewis, who’s covering the tournament for The (Delaware) News Journal. He mentioned to me that the next player on court, 16-year-old Kayla Day, won the Kalamazoo U.S. nationals and could be someone to watch out for. Well, the left-handed Day just dominated the first set against fellow American Madison Brengle, 6-2. Oh, and Day’s now up a break in the second. Maybe heading back to Court 4 now. Also in play is Court 17, where Cindy and Leslie are. Oh, and Milos Raonic and Dustin Brown are playing as well. The Canadian won the first set, 7-5. 7:57 PM EST: Oh, so I’m missing Phil Collins perform at Ashe Stadium and Leslie Odom, Jr. of “Hamilton” fame sing the national anthem. 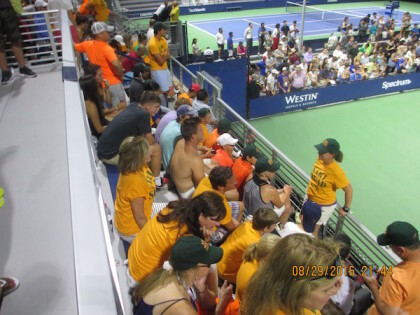 Well, I never said not going to Ashe Stadium doesn’t have any drawbacks. 7:30 PM EST: RACCOON ALERT! Outside of the upper level of Court 4! Don’t believe me? Here’s the picture I snapped just now! 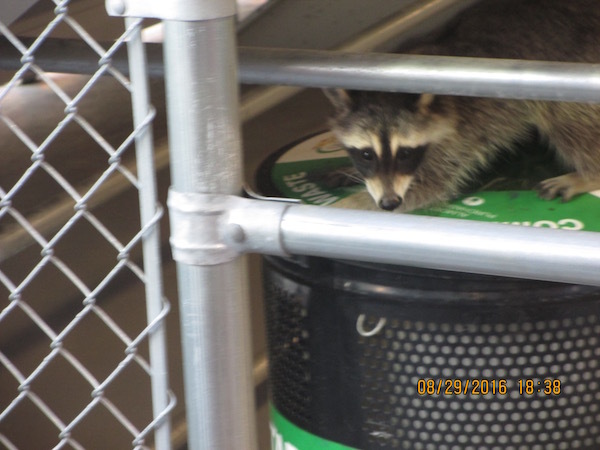 Again, RACCOON ALERT! 7:18 PM EST: Cindy and I are new BFFs! We become friends on Instagram and Facebook, and she’s telling me about her media ventures as well. Dr. No – oops, I’m sorry…Leslie – is also an amazing woman and personality! Meeting new people, becoming fast friends, watching great tennis…it’s what being here is all about! Thank you, ladies! Deciding where to go next. Probably to the media room to charge this laptop. 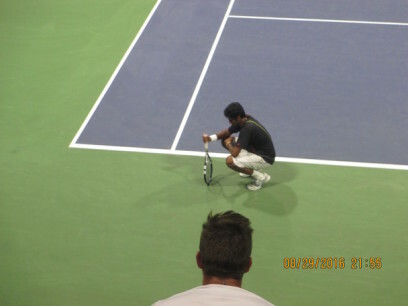 7:14 PM EST: Match over, and Cuevas goes to his knees in exultation after his emotional five-set win over Sela. Despite that, Sela thoroughly acknowledges his fans. Here’s a picture of a couple of his fans chanting his name during the match. 6:55 PM EST: Lots to type now! Cuevas, at 4-2, 30-40, gets a time warning, then calls for a medical timeout. Despite that, Sela Breaks and it’s 4-3. Also, the two ladies I’m sitting next to are hilarious! 6:39 PM EST: Here’s the picture of Pablo. 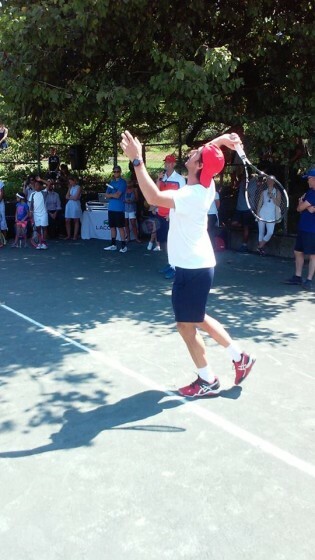 Nice man, great form of his serve…even if this serve was going at 70 miles per hour to a child. 6:37 PM EST: Looks like Sela’s needle on his gas tank is on E, as Cuevas holds at love for 4-1. Oh, we have a nice pic of Cuevas from the event in Central Park we attended yesterday. 6:35 PM EST: Sela dumps a forehand volley at net into the net and Cuevas has broken for 3-1. Sela fans start chanting “Let’s go Du-Di, let’s go!” But Cuevas is now on a roll, and just served an ace to go up 30-0. 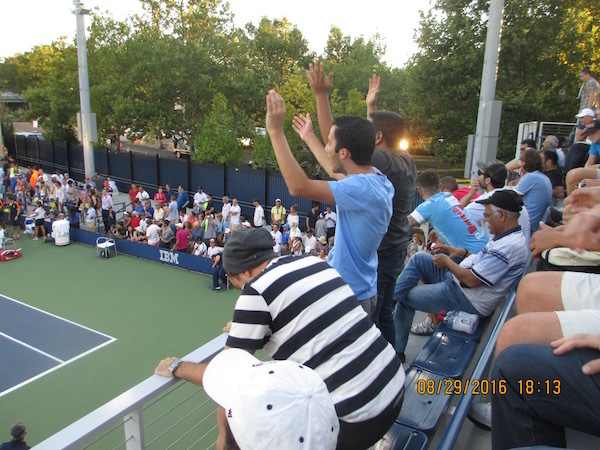 6:33 PM EST: As jam-packed as the new Grandstand was a few hours ago, it’s oozing humanity inside of Court 4 as well, with fan favorite Dudi Sela in a fifth-set battle with No. 20 Pable Cuevas. Walked in during an injury timeout at 1-all, as Sela was getting his right wrist taped. Cuevas held for 2-1 and now is up double break point on Sela’s (weak) serve. 5:53 PM EST: Not going to lie: I wanted to call Delbonis “Sabonis,” after the Hall of Fame basketball player Arvydas Sabonis. My mind is fried already! 5:51 PM EST: Looks like I’ll be sitting in between Courts 4 and 5 right now! Met Pable Cuevas yesterday at Central Park for an event put on by the CityParks Foundation and Team Lacoste. I told Cuevas that he should be wary of all of the support that Dudi Sela, his first-round opponent, gets in New York, especially with so many Israeli-Americans living in the Nig Apple. Cuevas then told me that Sela was his first-round opponent at the US Open last year as well! So, I guess he knows! They’re on Court 4 now, and, after Cuevas took the first two sets, Sela put up a bagel (6-0) in the third set and is up a break in the fourth at 3-2. On Court 5, American Brian Baker won the first two sets against Federico Delbonis of Argentina, but Delbonis is on the comeback trail and is now up a break in the fifth at 1-0. …and our view for the last service game and the tiebreak. Definitely heard Rod Roddy’s voice in my head: “C’mon down!” Yes, I still love The Price is Right! 5:17 PM EST: Tiafoe returns an Isner serve long, and there’s the match. Tiafoe and Isner embrace with a hug at the net, with Tiafoe looking as if he was about to cry on Isner’s shoulder. Or maybe he was just so darn tired in the heat. Great atmosphere! Both were winners today. On the scoreboard, it was 3-6, 4-6, 7-6, 6-2, 7-6 for Isner. 5:15 PM EST: Match point, Isner, after a volley into the net from Tiafoe. Tiafoe wins next point, but it’s 6-3 Isner and he has two serves coming! May only need one of them! 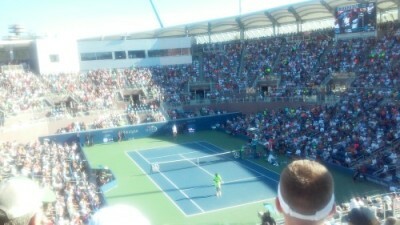 5:09 PM EST: “Oh my god!” That’s what the little girl said to me as Isner holds at love and forces a fifth-set tiebreak! And Isner gets the mini break to go up 1-0. Uh oh for Tiafoe! 5:07 PM EST: We’re in the new Grandstand!! And perfect timing to boot! It’s 6-5 Tiafoe, Isner serving! Sitting next to an engaging little girl who wants Isner to win, but would feel bad if Tiafoe lost a two-set lead! Awww!! 4:41 PM EST: Here’s the interview with Andrea, and ALOST helping to rekindle a friendship that was left off in Europe almost 15 years ago. Enjoy! 4:40 PM EST: OK, it’s off to the new Grandstand! Tiafoe is up 3-2 in the fifth, but it’s on serve. Also, our video with Andrea is done…and it’s great! Posting in another minute! 4:30 PM EST: Remember, go to the A Lot of Sports Talk Facebook page to get postgame match videos. We have Caroline Wozniacki’s post-match press conference up, soon to be followed by video from Svetlana Kuznetsova. 4:24 PM EST: Lots going on. Isner/Tiafoe is now in a fifth set. Also, Svetlana Kuznetsova is also one of the best on the WTA Tour in terms of interview. Very frank and open! I asked her how she got better at not thinking about the things she can control, she mentioned all of the pressure from the press, fans, and also from the parents/family, and concluded, “You are not a dollar. You can’t please everyone.” I’m going to incorporate that line more and more in my everyday life. 3:43 PM EST: At 5-all in the tiebreak, Tiafoe pushes a backhand crosscourt shot wide. Isner, with set point, closes it out with a powerful serve, and then a few fist pumps! We’ll be inside of the new Grandstand soon! Tiafoe up two sets to one, but Isner with the momentum. 3:40 PM EST: Is Tiafoe about to close out Isner in straight sets?!?! In third-set tiebreak, and watching it here in the media room as I upload Petko interview. Tiafoe up 3-1 in tiebreak…but now has lost mini-break. *When asked a follow-up question, if tennis compares to boxing: “Yes. Well, you at least you don’t get hit in the head with tennis balls. And the coup de grace: When Catherine Sneddon, the communications manager at the WTA Tour, asked if there were any questions that would be asked in Danish after all of the English questions were completed, “The Woz” interjected: “NO!” There you go! 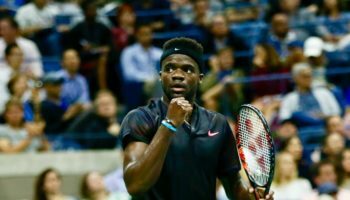 2:26 PM EST: Tiafoe has now broken Isner a third time in the match! Tiafoe is up a break, 2-1, in the second set! Maybe we’ll head out there once Petko interview done! 2:24 PM EST: A few minutes away from talking with Petko, but watching at my chair as the upstart Tiafoe takes the first set from the No. 20 Isner, 6-3. Tiafoe jumped out to 3-0 lead, but Isner broke back. (Wait, Isner broke someone?!?!) But then Tiafoe broke again in the first set and was able to close it out. 1:58 PM EST: Still haven’t headed onto a court to watch live action yet, but I’m getting my camera (and makeup) ready to talk to Andrea Petkovic at 2:30. Here’s hoping this interview is as epic as it’s shaping up to be. I better not screw it up! 1:40 PM EST: I’m a tall person, but I’m no John Isner! 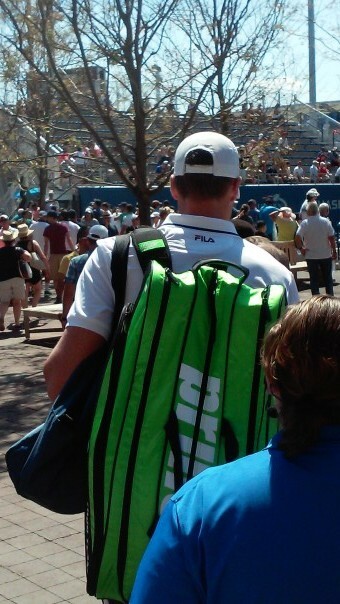 Speaking of Isner, here he is, walking out of the locker room and getting ready to head to the Grandstand to play fellow American Frances Tiafoe. Again, he’s TALL! 1:35 PM EST: Story gets crazier and crazier! After mentioning that I’ll try to interview Petko and ask her about the get-together that was 15 years in the making, Kathrin gave me her number to pass on to Petko! Definitely planning on capturing this on camera! 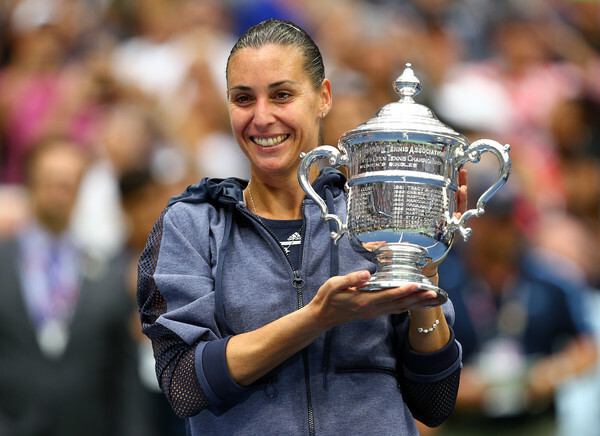 Stay tuned…Petko is available to the media at 2:30. 1:30 PM EST: Here’s the picture of Andrea and her former junior doubles partner, Kathrin. Had no idea about their relationship when taking this photo. Actually, I had no idea if I was actually taking a photo of Andrea, as the sun was beating down on the camera phone and me so bad! 1:24 PM EST: While taking pictures of Andrea signing autographs after her win, I ran into her former junior doubles partner. Even more amazing, Petko wrote her number on a towel and gave it to her courtside! Somehow, I was there to see the towel and ask her if Andrea had autographed it. When she gave me the 411 and the backstory, that blew me away! More to come later!! By later, I mean, real soon! 1:20 PM EST: Shame we never got into the new Grandstand for the end of the match, which Wozniacki pulled out, 6-4 in the third set. At the same time, WE MISSED ANDREA PETKOVIC DANCE!! I came to Court 6 just after she finished her jig after her win against surprise Montréal semifinalist Kristina Kucova. 1:02 PM EST: I’ve made it to the media room, and already am drawn to two things: the Taylor Townsend/Caroline Wozniacki match that’s 3-all in the third set and the smell meatballs in the media dining room. Have to set up, so might miss the end of the match at the new Grandstand Stadium.